Arch Reactor is a shared space where creativity and ingenuity may reach critical levels! 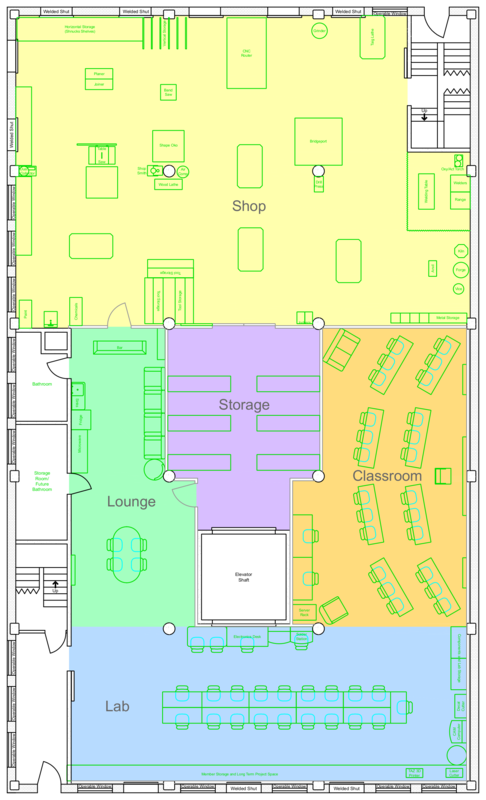 Our 5000 ft2 reaction chamber contains a Shop full of equipment, a Lab to work on your projects, a Classroom to enrich your mind, and a Lounge where ideas can fuse together. Our space is a community workshop where members learn, collaborate, and bring ideas to life. Our members keep everything running, and our community is always working to improve the space. Our space does not have any staff to keep it open for guaranteed hours, but most members open the space up for anyone to come by (check our space status switch on the front page). Check our calendar, but it is almost always open Sunday and Tuesday nights, and anyone can come by for a tour, help with a project, or just to hang out. Become a supporting or full member to gain use of the shop, 24-7 access, and other benefits! The Lab area features a lot of table space for everyone to work on their projects in a low-dust environment. There are also many tools for working on electronics and other clean projects, including a soldering station, vinyl cutter, 3D printers, and an 80W laser cutter. There are shelves where members can keep a private tote, and an assortment of salvaged and donated parts available for anyone to use. The classroom seats over 20 students in a clean and quiet space conducive to learning. It is not completely finished, but it is functional and we have been using it to hold classes. We currently have two large flat panel displays on the walls for presentations. We expect in the future to add a large projector screen, white boards, a wireless microphone system, and a live streaming camera all available for any class. The lounge will be a cozy area for everyone to relax and socialize in. We currently have a fridge full of soda and beer and freezer with pizza, and we hope to soon have a full kitchenette. There are couches and comfy chairs, a MAME machine, and soon there will be a console gaming area as well. Many of us urbanites don't have garages to tinker in, which is why we have a fully featured shop in our space, including saws, vices, grinders, lathes, drill presses, planers, welders, kilns, forges and all the tools we need to create. Some tools are owned by the organization, but most are owned by our members and shared. Use of the shop is restricted to members, and you should always be trained before using a new tool.